A company is a juristic person with a right to sue and with a liability to being sued. It can act in its own name and is not a mere association of the share holders in the sense in which a joint Hindu family is. When a public limited company is a creditor of another company, it cannot be said that some shareholders of the former company are creditors of the latter company. A company is a distinct entity separate from share-holders and Directors and liability of a company cannot be passed on to its directors personally, Company’s share holders do not own anything owned by company. Sale to a company can never be considered to be a sale to shareholders. Public company means a company which is not a private company. Section 2(30). A private limited company is one restricting right to transfer its shares, limiting number of its members to fifty (not including persons in its employment) and prohibiting any invitation to public to subscribe for its shares or debentures. PLJ 1986 Lah. 408. There is a long and complicated process for the formation of public limited company. Many legal documents are to be prepared and submitted to the registrar’s office which require long time. There is simple process for the formation of the partnership. No legal documents are necessary. Agreement by oral or written is required only for formation of partnership. The activities of the public limited companies are controlled by the companies Ordinance 1984. Partnership is controlled by the partnership act 1932 which was adopted in our country after partition in partnership. There is no restriction for the maximum number of members of Public Limited Company. Public limited company may be million of thousand but not less than save. Partnership consists of at least two partners but no more than twenty in case of ordinary business and not more than then in case of banking business. The liability of shareholders is limited to the unpaid value of the shares and the private assets of the shareholders are not liable to settle the obligations of the public limited company. Every partner has unlimited liability in his firm of partnership. Partnership means that the liability of partners is not limited to the invested amount but private assists are also liable to clear the liabilities of the firm. There is no restriction for transferring of share of public company. Share holders may easily dispose of their share in the stock exchange market in public company. A partner cannot transfer his share and interest to other persons without the consent of existing partners of partnership. Public limited company is created by law and possesses separate Leal entity. So it can purchase property in its own name. It can sue in its separate position. Partnership has no separate legal entity from its members. Partners cannot be separated from the partnership firm. Public limited company’s authorized capital is mentioned in the memorandum of association. It can be increased or decreased by special resolution which is passed in the shareholders meeting after the sanction of court in public limited company. Statutory books and other account books are to be maintained by law of public limited company. There is no compulsion to keep statutory or definite books in partnership. Each partner is allowed t inspect and copy the accounts of partnership. Shareholders who actual owners of the company are not allowed participating in the activities of the public limited company. But Board of directors is elected by the shareholders which are considered supreme authority of the public limited company. So all the activities are conducted by these persons in public limited company. Each partner is allowed to conduct personally the business activities in partnership. But generally one or two partners are selected to manage the firm of partnership. Profit is distributed among the shareholders according to the provision of Articles and decision of the Board of directors in public limited company. Partnership is distributed among the partners according to their deed. Accounts must be audited by the qualified Chartered Accountant according to the companies Ordinance in public limited company. Audit is not compulsory by law in partnership. But partnership depends upon the partnership agreement. 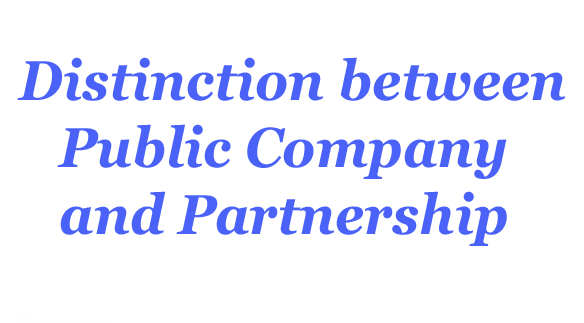 Public limited company has continued existence. The life of the directors and shareholders is not connected with running business life of the public limited company. 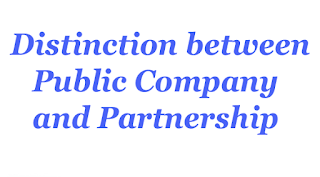 So public limited company's activities are not affected by the retirement or death of any shareholder. Partnership does not possess long life. Partnership’s business may be affected by the death, insolvency or retirement of any partner. Certain documents, statements and reports must be submitted to the government authority in public limited company. There is no restriction to submit the various reports and documents to any authority of partnership. The promoters are restricted to carry on business which is mentioned in the object clause of memorandum of association in public limited company. Partners may carry on any type of business and partnership may easily be changed by mutual consultation. Public limited company has to call necessary meetings of the shareholders in which problems are disposed of by various restorations. No compulsion to call any type of meeting and submission of reports to the registrar in partnership. Public limited company can issue shares, debentures fans other securities to increase its capital and business funds. Partnership cannot issue any type of securities in the market to increase its financial sources. Public limited company cannot be dissolved easily. There is a separate legal process for the winding up of the public limited company. Public limited company can be wound up according to the provision of Companies Ordinance. Partnership can be dissolved easily by mutual consent of the partners. Partnership at will may be dissolved by any one of the partners by serving notice of fourteen days to other partner or partners in partnership.